Home » Blog » Countdown – Three Days! This coming Sunday Australia’s first saint Mary MacKillop will be cannonised! 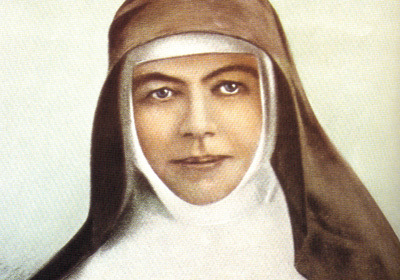 I have long had a love for Mary MacKillop, a love nurtured as a child by the St Josephites nuns who taught me. Yep I’m proud to be a Brown Joey kid, I loved the Joey nuns, in particular I loved St Mary H. My grandmother and her siblings, my mother and her siblings and in turn my brother, cousin and I were taught by the Joey nuns. We had a solid education both spiritually and academically. The direct result of Mother Mary MacKillop’s vision to provide Catholic education for all Catholic children of Australia. In my late teens I visited South Australia and was most excited to have the opportunity to visit Penola. Unfortunately I arrived outside of opening hours to view Mother Mary’s school and the local Church. Still I enjoyed wandering the street, viewing from the outside and imagining. This week the younger children and I are reading “Derring-Do-Mary – Sr Margaret” a long time favourite and I’m planning on reading The Black Dress – Pamela Freeman with the older children. We are learning a hymn called ‘Mother Mary of the Cross’ from our Cantabile Singers CD. We’ll also be visiting here for some fun crosswords, find a word and other resources. 3 Comments on Countdown – Three Days! We visited the little museum when we were in Penola- 10 years ago now- can you believe it? we lived in Millicent for 2 years which is only half an hour from Penola. I am so excited about this weekend. We have a fiesta at our school that is still run by Josephites. Can't believe it was 10 years ago! Didn't know you went there. I went to Millicent on my trip too, I lived there for a couple of weeks.